What is SSB PROGRESSIVE GROUP TASK? 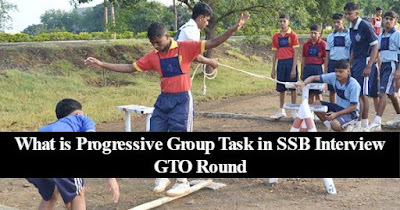 SSB Progressive Group Task (SSB PGT) is the most important and interesting task of the GTO series. As the name indicates, prima facie, it is a progressive group task. In my previous articles you can find more about how SSB Progressive Group Task (SSB PGT) is conducted or Rules of Progressive Group Task (SSB PGT). But in this article we will learn some more details about Progressive Group Tasks in SSB. What exactly needs to be done in SSB Progressive Group Task (SSB PGT)? Respect your group members. It is sure, you will earn respect too. Discuss your ideas with them. Have their word of consent. If someone is giving a good idea, make sure you appreciate it and get it implemented. Take my words. It’s all about Espirit De Corps, my friends. Encourage, if possible, other members of the group who are a bit hesitant in coming Show keenness and interest. Be lively and enjoy the task rather than showing your OLQ’s. Leave it to the assessor to see what he wants, while you do your bit. Achieving the group goal is important here and your contribution to it is under assessment. Try and optimize your performance. ‘Once you feel that you have given your contribution, take time to receive ideas from others and get them executed’. We constantly give and receive ideas from others in a group, this being scientifically proven. When we have some ideas and views in our mind, we are at a higher potential, as this is a form of energy. And, according to Second Law of Thermodynamics, energy is only transferred from one form to another. Rather, here I would say from one person to another. It is a natural process. But, we don’t stop to listen and continue giving our opinion, thus violating the Thermodynamic equilibrium. Just imagine? Please never try to deliberately display the OLQ’s because, unfortunately, you cannot! Whatever traits that you possess, won’t hide themselves from coming out for too long. You cannot stay neutral; some action along with a behavioral pattern has to come either as an action or reaction. Action and reaction, both are projective in their nature, neither they are subjective nor an objective one. In behavioral psychology, whatever you are trying to show in deliberation is interpreted and termed as ‘exaggeration’. And it is established that, whenever someone is exaggerating something, that something is not actually present in that person. Your eyes and your body language never change to exaggeration. As a result, the person is putting extra efforts to show it off. As the famous philosopher Grouch Marx once said “There’s one way to find out if a man is Honest – ask him. If he says ‘Yes’, you know he’s a crook”. Keep the Savoir Faire and maintain yourself in control. Learn to control your emotions. When you keep on shouting your views and paying no heed to what others are trying to convey, you are disturbing the thermodynamic equilibrium. It’s a bit difficult to achieve patience, but not It’s never too late to improve oneself in life. The wish to do well should be accompanied by a will to do well. Establish and maintain a good rapport within your group. We are all strangers from different parts of the country and will be together for five days of testing. We all are here for our individual selection. Who knows, if we all get to meet each other in the future or not? So, why should anyone fight or quarrel with the group? Enjoy the moments of your stay at the centre. Stop performing! Start enjoying the SSB. Do you adapt yourself to social environment and adjust well with persons and social groups with special reference to superiors, equals and subordinates? Have you ever tried to put yourself in another man’s position so as to appreciate justifiable difficulties, to enable rendering of help in a proper way? Have you ever tried to understand and manage the feelings of a person that you have dealt with? Do you show keenness and interest in helping others and in service towards others? Do you participate willingly in harmony with others, when in a group and try to achieve the group goal? Whom do you give preference to, collective effort or individual effort, when working together in a group? Do you feel the spirit of team when you are in a team? Are you loyal to aim of the group and subordinate your individual aim to the group aim? Do you take initiative to do your best in carrying out even unspecified and probably unforeseen duties and obligations rather than faithfully carry out what you are told to do? Are you selfish in your motives and obstruct the passage of others while in a group? No Comment to " (SSB PGT) – Progressive Group Task for SSB Interview "